Missing a checkshot survey, and only have some known T-D pairs? Use this process to manually create a time-depth survey. Manually enter 2 time-depth pairs to create the initial survey. 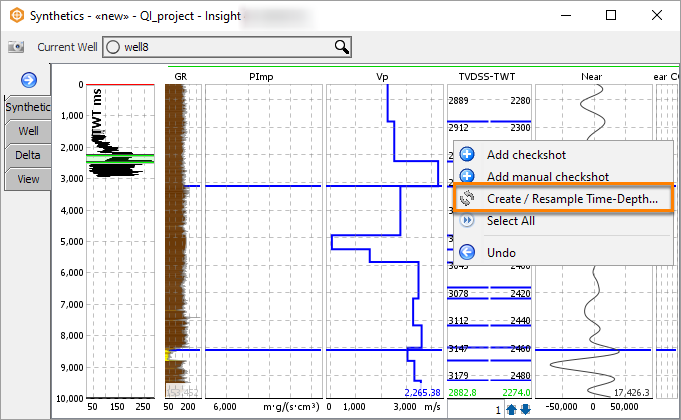 Right click on the T/D Pair Track and select Create/Resample Time-Depth Survey. Manually input the Initial T-D Pair and T-D Pair 2 (preferably deepest). Click OK. 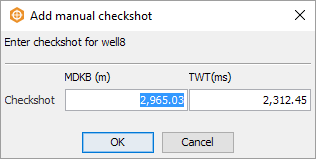 The checkshot will appear in TVDSS-TWT track. Add more manual checkshots by right clicking and selecting Add Manual Checkshot.